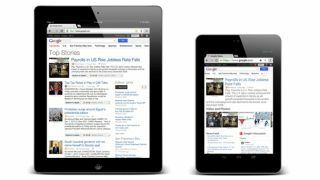 Google has launched a slick, new version of its Google News service for tablets like the iPad and the Google Nexus 7. The popular portal, which aggregates trending stories from around the web, has a new spacious design, which highlights the lead article from a particular news item, rather than a list of multiple sources. Users can then choose to 'Explore in depth' to view related stories from a host of other online sources. The company has also included neat swiping gestures, allowing users to move freely between the various news categories (sport, business, technology, etc.). If users are looking at a story 'In depth' then a swipe to the left and right will switch to the next story, while staying within the in-depth view. Product manager Mayuresh Saoji claimed on the Google News Blog that the new UI was akin to flipping through a newspaper. He wrote: "There's something special about reading news on your tablet. "Indeed, swiping through articles brings to mind the familiar feeling of flipping through a favorite magazine or newspaper. Starting today, Google News feels even more natural and fluid on tablet devices." Websites currently receive over 6 billion referrals a month from the Google News portal. The update is only appearing on the news.google.com portal at the moment and doesn't appear to have rolled out to the regional offerings as yet.